Sacramento International Car Show, Yet Again. The 24 Hours of Lemons Forums → Other Random Car Stuff → Sacramento International Car Show, Yet Again. 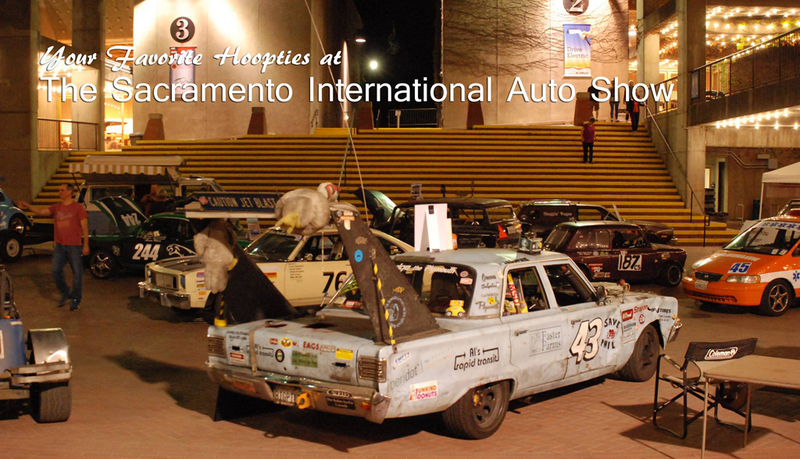 Topic: Sacramento International Car Show, Yet Again. Yes we want you back - you are all just wonderful!!! Dates are Oct. 20-22. Plan on the same spot. So, seeing as there are no west coast races that weekend, plan on it. Re: Sacramento International Car Show, Yet Again. This just about fills my dance card for the season. Rambler will be home then. Along with the Omega. This event is still 6 weeks out, but it's time to start getting ready, or at least not planning anything else, because this is importanter. I'll start emailing people to get firm commitments, car counts, etc. Hey all, this year we got an invite. Not only did they not forget us like they did for the past two years, but contacted me and asked us to come, the event organizer telling me we are her favorite exhibit and the most popular with visitors. My confirmation bias being what it is, I believe her. The dates are October 20 - 22, at Cal Expo, and we'll be in the same space as last year, that being the open courtyard area in the middle of the other exhibits. There's no way people will miss us. We're practically blocking their access to the other exhibits. Load-in is on Friday and we retrieve our cars on Sunday at 6 PM. I'll be there the whole time looking after things and helping out as needed. Like last year I'll make an 11x17" poster for each car exhibited, and I'll have extras printed so you can give some to your friends, team mates, frame and hang in your trophy room. I'll have pop-ups, water, a table for stickers and literature, extension cords, a laptop playing racing videos, maybe even Lemons race recaps. I may spring for Christmas lights. Gavin's looked so good/silly strung around his Limo hauler. I'll have copies of the spectator guide (attached) I made up last year to hand out. Let me know if you have things along these lines to contribute. This year I think I'll try something with awards, best in show and such, where visitors vote/comment on the cars. I'll do it more as a way to get the visitors involved, and to have fun. I've got a bunch of old Opel pistons and transmissions laying around here. I'm sure I could use them to make up some kind of trophy. Being outside we won't have to empty our fuel tanks. In fact, we can run our engines. The Chicken car was certainly a favorite in this regard last year. Last year Adrian and I took our cars (Chicken car and Tinyvette) over to the coned course the manufacturers set up. I'm pretty sure the Tinyvette was quicker. We'll see this year. In past years we had 10 to 15 cars, but we can accommodate a few more, so pass the word. I know the Coyote team wanted to come last year but got the info late. I think Ferdinand the Bug will be coming for the first time. The Jagvair is out this year, and the Chicken car may or may not be at a race at Laguna Seca that weekend. Of course the Tinyvette will be there and a rethemed Restart Racing truck. I'll update you as to who else is coming as confirmations come in. So, check your calendars and let me know if you can bring a "car". Faster Farms is a maybe. They are hoping to race with Lucky Dog at Laguna Seca that weekend. Ferdinand the Bug is a maybe. Bricklin, too. No confirmation on the UDC yet but I expect it will be coming. I'm still expecting to hear from other teams that came last year. Someone has offered to built their car at the show and asked if power is available. It is. We've got room for about 15 cars. Join us. Nick will (probably) award you with a GOOPBF certificate. Breaking news, Faster Farms has confirmed. Adrian and the chicken car will be there. Sorry the Jagvair will not make it this year, niece is getting married that weekend. I will pencil in for next year to bring the Jagvair 2.0. Where's it parked. I might come get it. The Model T GT and Pinto Bean are available but need transport. Jay says we can have the UDC. It's at Chateau Montoya, will need transport. CrazyMike will be bringing Scrubby and the California Raisin. Nick has promised GOOPF certificate for participating teams. I need a driver, someone who can help me get the UDC to my place tomorrow so that on Thursday I can get it to the show in Sacramento. My plan is to leave here, Esparto, in the morning headed for Pete's place near Santa Cruz to fetch the 'Bee, and on the return trip get the UDC and caravan back to Esparto. I know, late notice, but lots of last minute things are changing, like the fire in Pete's neighborhood. Correction, Dave lives in Clayton, I'm pretty sure.